Workplace safety is very important. It is one of the best things business owners can do for their employees and bottom line. Workplace safety is important because it can help prevent accidents, deaths, financial losses and property damage. Safety in the workplace is a good investment. Here are some of the benefits in practising workplace safety. • Investing in workplace safety can prevent absenteeism. When the work environment is safe, there are fewer accidents in the work place. • Working in a safe environment results in happier employees and happy employees are productive employees. • Workplaces that are safe experience a decrease in employee insurance claims. This is very beneficial to businesses because insurance companies can give employers better rates and higher work safety grades. • When work safety is prioritized, overall productivity improves. Aside from decrease in accidents and absenteeism, safety reduces business which creates productive work environments. • Employees like working in a safe environment. Loyalty is important to businesses because it can help to retain top talent. • Companies that prioritize workplace safety also enjoy better public image. When there is fewer news regarding accidents in the workplace, other people will perceive that the company is a safe environment for workers which can help attract new talent. • Implementing safety measures results in better health for employees. This in turn can prevent employees from getting sick or leaving the company. 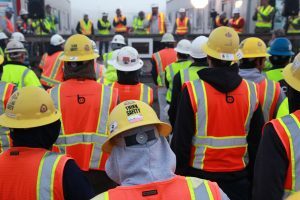 The key to ensuring better workplace safety is to educate employees and to implement it consistently. Workplace training can be done online with companies like Atlantic Training. They can help train your workforce using 100% OSHA/DOT/EPA compliant training products. Their extensive training library can be accessed online and are perfect resources for human resource department or new hires. Atlantic Training has safety training DVD and booklets. They cover topics like schools, construction, drugs and alcohol, food, health care and driving. Interested parties can also access their 10 and 30 hour safety training covering general industry and construction online. Companies can also make their own safety training packages. Every created video title includes training DVD, printable leader’s guide, printable employee quizzes, printable certificates, wallet cards and printable scheduling form. Companies can select from Atlantic Training’s different topics to integrate and personalize for their business use. Workers want to do their jobs in a safe environment so that they can concentrate on what they are doing without having to worry about their well-being. Responsible businesses understand that practising good workplace safety improves productivity and bottom line. No matter how you look at it, running a business that prioritizes workplace safety is very advantageous.